Background: We analyzed data on the understanding of depression among patients who were prescribed antidepressants to determine when psychoeducation should be provided. Patients and methods: A total of 424 outpatients were enrolled in this study. We used an original self-administered questionnaire consisting of eight categories: (A) depressive symptoms, (B) the course of depression, (C) causes of depression, (D) the treatment plan, (E) the duration of antidepressant use, (F) discontinuation of antidepressants, (G) the side effects of antidepressants, and (H) psychotherapy. Each category was assessed with the following two questions: “Have you received an explanation of this topic from the doctor in charge?” and “How much do you understand about your treatment?” The level of understanding of patients was rated on a scale from 0 to 10 (no understanding to full understanding; 11 anchor points). Symptoms were evaluated using the Quick Inventory for Depressive Symptomatology, Japanese version (QIDS-J) and other scales. Participants were divided into two groups: patients receiving psychoeducation at their first visit vs patients receiving psychoeducation after their first visit. Results: Of the patients who had received an explanation of each psychoeducation item, a greater proportion were in the first visit group than in the after first visit group for nearly all items. Compared with the after first visit group, the first visit group showed a better understanding of each psychoeducation item and significantly lower QIDS scores for those receiving explanations of Items A and C. There was no significant difference between the two groups in remittance rates. Conclusion: Psychoeducation on depression, especially regarding the symptoms and causes of depression, should be provided at patients’ first visit. Thus, it is important to provide psychoeducation to patients with depression. However, the actual prevalence of psychoeducation for patients with depression and their level of understanding of depression have not been thoroughly examined. Accordingly, in a previous study, we assessed the understanding of depression among outpatients who had experienced or were experiencing a depressive episode and who had taken or were taking antidepressants.11 In that study, Kudo et al found low levels of understanding of depression among patients, and in a secondary analysis, several questionnaires that evaluated patients’ understanding of depression were significantly associated with the severity of depression (Tomita et al, accepted). Although we have studied the characteristics of patients’ understanding of depression who were treated with antidepressants, there have been no reports that address the timing of psychoeducation in this population. All previous studies that have discussed psychoeducation have investigated psychoeducation at specific times but have lacked information about the optimal time to provide it.4–8 In the present study, we reanalyzed data from our previous study on the understanding of depression of the patients who had experienced or were experiencing a depressive episode and who had taken or were taking antidepressants to determine when patients should receive psychoeducation. This study was conducted from February to October 2013. Participants were recruited if they 1) were outpatients; 2) had experienced, or were experiencing, a depressive episode; and 3) had taken antidepressants, or were taking antidepressants. We excluded patients who could not complete the questionnaire, which assessed their level of understanding of depression, as well as patients with severe dementia, severe depression, mental retardation, or blindness. For ethical reasons, physicians excluded patients with delusions, suicidal ideation, or stupor due to severe depressive states because the administration of questionnaires in these situations is invasive. In total, 424 outpatients were enrolled in the present study. The response rate was 88.3%. The study participants were outpatients at six hospitals in Aomori and Akita, Japan, including Hirosaki University School of Medicine and Hospital, Seihoku Chuo Hospital, Hirosaki Aiseikai Hospital, Kuroishi General Hospital, Mutsu General Hospital, and Odate City General Hospital. The ethics Committee of Hirosaki University School of Medicine and Hospital approved this study, and the patients or their authorized representatives provided written informed consent prior to participation. To assess the participants’ level of understanding of depression, we used an original self-administered questionnaire that consisted of eight categories: (A) depressive symptoms, (B) the course of depression, (C) the causes of depression, (D) the treatment plan, (E) the duration of antidepressant use, (F) discontinuation of antidepressants, (G) the side effects of antidepressants, and (H) psychotherapy. Each category was assessed with the following two questions: “Have you received an explanation on this topic from the doctor in charge?” and “How much do you understand about your treatment?” The participants responded to whether they had received explanations for each item with “yes” or “no”. Their level of understanding was rated on an 11-point scale from 0 (“I do not understand it at all”) to 10 (“I understand it perfectly”). The total score of the eight items was considered the participant’s understanding score. We administered the Quick Inventory for Depressive Symptoms, Japanese version (QIDS-J) to evaluate the severity of depression. The reliability and validity of this instrument have been previously established.12–14 In the present study, we defined subjects with QIDS scores ≤5 as remitters. To evaluate patients’ general functioning and illness severity, we used the Global Assessment of Functioning (GAF) and the Clinical Global Impression – Severity (CGI-S) scales, respectively. The GAF is a numerical scale (0–100) used by mental health clinicians and physicians to subjectively rate adults’ social, occupational, and psychological functioning. The CGI-S is commonly used to measure symptom severity, treatment response, and treatment efficacy in studies of patients with mental disorders.15 In this 7-point scale, clinicians are asked to rate the severity of a patient’s illness at the time of the assessment relative to their past experience with patients with the same diagnosis. Compared to their overall clinical experience with related patients, physicians rate the severity of a patient’s mental illness at the time of the evaluation as 1 (normal, not at all ill), 2 (borderline mentally ill), 3 (mildly ill), 4 (moderately ill), 5 (markedly ill), 6 (severely ill), or 7 (extremely ill). We collected data regarding patient demographics, diagnosis, age at onset, disease duration, duration of antidepressant use, number of major depressive episodes and hospitalizations, and employment status from patients’ medical records. All participants were diagnosed using the Diagnostic and Statistical Manual of Mental Disorders, fourth edition. We divided the patients into two groups according to when they received psychoeducation for each of the relevant categories; patients in the “first visit group” received psychoeducation at their first visit, and patients in the “after first visit group” received the education after their first visit. We compared the two groups’ remittance rates, understanding scores, and clinical scores using chi-square tests and unpaired two-sample t-tests for each psychoeducation item. A p-value <0.05 was considered as significant. The data were analyzed using SPSS for Windows 22 (IBM Corporation, Armonk, NY, USA). Table 1 lists the percentages of participants who received explanations of each psychoeducation item and the timing of the explanation. Item A was the most frequently explained topic, and Item F was the most rarely explained topic. Similarly, Item A was the most frequently discussed topic at the first visit. Notes: A, depressive symptoms; B, the course of depression; C, the causes of depression; D, the treatment plan; E, the duration of antidepressant uses; F, discontinuation of antidepressants; G, the side effects of antidepressants; and H, psychotherapy. 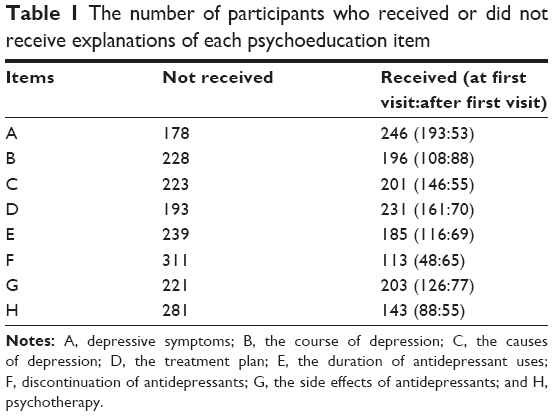 Table 2 gives the comparisons of the understanding scores for all psychoeducation items, the depression severity scores, and the proportion of subjects with remission between the two groups divided according to when subjects received explanations of the items: at their first visit or after their first visit. Notes: A, depressive symptoms; B, the course of depression; C, the causes of depression; D, the treatment plan; E, the duration of antidepressant uses; F, discontinuation of antidepressants; G, the side effects of antidepressants; and H, psychotherapy. *p<0.05. Abbreviations: GAF, Global Assessment of Functioning; QIDS-J, Quick Inventory of Depressive Symptomatology, Japanese version. Among subjects who received an explanation of Item A, those in the first visit group showed significantly higher understanding scores on Items A and B and lower QIDS scores than those in the after first visit group. There were more men in the first visit group than in the after first visit group. In subjects who received explanations of Item B, those in the first visit group showed significantly higher understanding scores on Items A and D than those in the after first visit group. In subjects who received explanations of Item C, those in the first visit group had significantly higher understanding scores on Items B, D, and E and lower QIDS scores than those in the after first visit group. In the present study, we investigated subjects’ level of understanding of depression and the differences between two groups of patients divided by when they had received explanations of psychoeducation items: the first visit group and the after first visit group. The first visit group showed better overall understanding of all psychoeducation items than the after first visit group. In addition, subjects in the first visit group who were informed about Items A and C showed significantly lower QIDS scores than their counterparts in the after first visit group. This study is the first to report the differences in the understanding of depression between two groups based on when patients received psychoeducation. Items A and C in particular should be explained to patients with depression at their first visit to facilitate a better response to treatment. Although we found that providing explanations of Items A and C at their first visit might be effective for patients with depression, we did not determine the reasons for this finding. Regarding Item A, ie, “symptoms”, explaining the symptoms of depression might help patients better understand their condition and recognize that their symptoms are common among those with depression. For Item C, which addressed “causes”, patients who received explanations of the causes of depression might better understand the biological and psychological factors involved and be satisfied with understanding the causes of their condition. This understanding might improve their acceptance of their diagnosis, their perceptions of the need for depression treatment, and the doctor–patient relationship. For both Items A and C, or general topics of depression, these explanations might prevent the rejection of illness and treatment due to stigma. In our previous study, the level of understanding of Item C showed a significant positive association with QIDS score, although we did not account for whether the subjects had received explanations of psychoeducation items (Tomita et al, submitted). In that study, subjects with a better understanding of Item C showed worse depression, whereas in the present study, subjects who did receive an explanation of Item C at their first visit showed greater understanding and significantly lower QIDS scores than those who received this information after their first visit. Whether patients received explanations of Item C, ie, “causes”, the timing of the explanation influenced the association between understanding of the “causes” of depression and depressive state. There were differences in the understanding of some psychoeducation items and the QIDS scores between the first visit and after first visit groups; however, there was no significant difference between the two groups in the rate of subjects with remission. For patients informed about Items A and D only, the rates of remission were higher in the first visit group and the p-values of the rates showed marginal significance. Details regarding the explanations provided for each psychoeducation item were not controlled for in the present study, and some subjects might not have received sufficient information from their physician despite receiving an explanation of each item. A more effective and structured explanation might improve the remission rate of depression as well as the QIDS score and depressive state. The present study had some limitations. First, we studied only subjective evaluations of receiving and understanding psychoeducation items. The results may not reflect the actual provision, receipt, and understanding of psychoeducation in clinical settings. Therefore, future studies should use objective evaluation scales. Second, the methods used to explain the psychoeducation items to patients were not studied. We did not discuss whether patients received their knowledge of psychoeducation items from, eg, physicians, lectures, books, TV programs, or the Internet. In some cases, their understanding of the items might have been incorrect, and these misunderstandings might have influenced the results. Third, we did not control for the explanations provided by the subjects’ physicians. Despite receiving an explanation, some subjects might have received insufficient information or could have received a better explanation that was adjusted to their comprehensive ability or recognition of depression. In future studies, we should study structured and controlled explanations of psychoeducation items and construct a suitable explanation for each patient with depression to facilitate better treatment. Fourth, the content of treatment of the subjects was unclear. In addition to antidepressants, a part of the subjects might have received nonmedication treatment (cognitive behavior therapy, interpersonal therapy, and exercise therapy). Better timing and contents of psychoeducation might vary about the content of the treatment. We investigated patients’ level of understanding of depression as well as the differences between those receiving explanations at their first visit and after their first visit. The first visit group showed a better understanding of each psychoeducation item as well as significantly lower QIDS scores for those receiving explanations of Items A and C. We should explain the items included in psychoeducation of depression, especially those related to symptoms and causes of depression, at patients’ first visit. The authors would like to thank all of their coworkers on this study for their helpful contributions in collecting and managing the data. The funders had no role in the study design, data collection and analysis, decision to publish, or preparation of the manuscript. Norio Yasui-Furukori has received grant/research support or honoraria from, and has been a speaker for, Asteras, Dainippon, Eli Lilly, GSK, Janssen-Pharma, Meiji, Mochida, MSD, Otsuka, Pfizer, Takada, and Yoshitomi. The other authors report no conflicts of interest in this work. Brown GW, Birley JL, Wing JK. Influence of family life on the course of schizophrenic disorders: a replication. Br J Psychiatry. 1972;121(562):241–258. Kemp R, Hayward P, Applewhaite G, Everitt B, David A. Compliance therapy in psychotic patients: randomised controlled trial. BMJ. 1996;312(7027):345–349. Cardoso Tde A, Farias Cde A, Mondin TC, et al. Brief psychoeducation for bipolar disorder: impact on quality of life in young adults in a 6-month follow-up of a randomized controlled trial. Psychiatry Res. 2014;220(3):896–902. Wells KB, Sherbourne C, Schoenbaum M, et al. Impact of disseminating quality improvement programs for depression in managed primary care: a randomized controlled trial. JAMA. 2000;283(2):212–220. Rost K, Nutting P, Smith J, Werner J, Duan N. Improving depression outcomes in community primary care practice: a randomized trial of the quEST intervention. Quality enhancement by strategic teaming. J Gen Intern Med. 2001;16(3):143–149. Morokuma I, Shimodera S, Fujita H, et al. Psychoeducation for major depressive disorders: a randomised controlled trial. Psychiatry Res. 2013;210(1):134–139. Shimazu K, Shimodera S, Mino Y, et al. Family psychoeducation for major depression: randomised controlled trial. Br J Psychiatry. 2011;198(5):385–390. Kronmuller KT, Victor D, Schenkenbach C, et al. Knowledge about affective disorders and outcome of depression. J Affect Disord. 2007;104(1–3):155–160. Donker T, Griffiths KM, Cuijpers P, Christensen H. Psychoeducation for depression, anxiety and psychological distress: a meta-analysis. BMC Med. 2009;7:79. Brown C, Battista DR, Sereika SM, Bruehlman RD, Dunbar-Jacob J, Thase ME. How can you improve antidepressant adherence? J Fam Pract. 2007;56(5):356–363. Kudo S, Tomita T, Sugawara N, et al. The low level of understanding of depression among patients treated with antidepressants: a survey of 424 outpatients in Japan. Neuropsychiatr Dis Treat. 2015;11:2811–2816. Trivedi MH, Rush AJ, Ibrahim HM, et al. The inventory of depressive symptomatology, clinician rating (IDS-C) and self-report (IDS-SR), and the quick inventory of depressive symptomatology, clinician rating (QIDS-C) and self-report (QIDS-SR) in public sector patients with mood disorders: a psychometric evaluation. Psychol Med. 2004;34(1):73–82. Fujisawa D, Nakagawa A, Tajima M, et al. Reliability and validity of quick inventory of depressive symptomatology Japanese version. Seishin Shinkeigaku Zasshi. 2008;2008(Suppl):S–324. Guy W. Clinical Global Impression Scale (CGI). ECDEU Assessment Manual for Psychopharmacology. Rockville: US Dept. of Health, Education, and Welfare, Public Health Service, Alcohol, Drug Abuse, and Mental Health Administration, National Institute of Mental Health, Psychopharmacology Research Branch, Division of Extramural Research Programs; 1976:217–222.